Welcome to IRL, an ongoing feature where we talk about the gadgets, apps and toys we're using in real life and take a second look at products that already got the formal review treatment. I know what you're thinking: isn't Dell's Precision M3800 workstation for graphics pros or architects? Yes, but just look at it: it's gorgeous in aluminum and carbon fiber, weighs a mere 4.15 pounds, has a fourth-gen Intel Core i7 chip with 16GB of RAM, NVIDIA Quadro K1100M pro graphics and -- get this -- a 3,200 x 1,800 touchscreen. The frosting on the gateau, as it were, is the price: it runs $2,554 with a 512GB SSD. If you were eyeing a Retina display MacBook Pro or another high-end 15-incher with discrete graphics, that'd be pretty tempting, right? Maybe yes and maybe not –- let's take a closer look. On to the screen: it's everything a pro could want, with a bright panel, good contrast, a wide color gamut and that 3,200 x 1,800 pixel count, all tied to a muscular 2GB Quadro K1100M/Intel 4600 HD graphics setup. However, there's a huge caveat here that isn't even Dell's fault: Windows 8 doesn't scale certain apps properly on super-high-res screens, and some important ones like Photoshop and Premiere Pro CC actually scale terribly well (this issue has now been resolved for Adobe with recent Windows 8.1 updates, though Google's Chrome and other apps still suffer from it). As a result, you can barely read the teeny toolbars and command screens, let alone click on them. Some workarounds are available, but until the affected companies get around to supporting higher-res screens, this scaling issue can effectively nullify the M3800's resolution advantage. The chiclet keyboard, meanwhile, feels great, and worked well for typing this article. 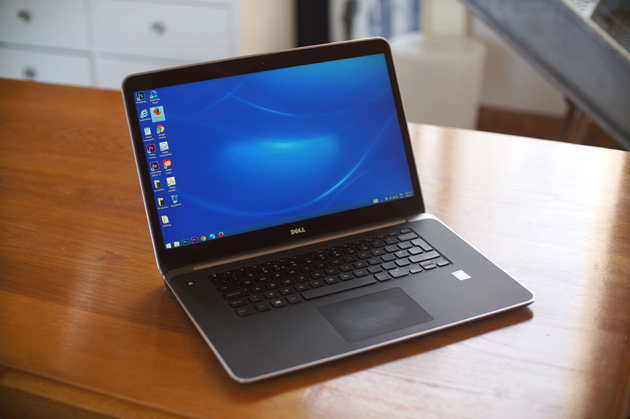 Unfortunately, I have to scold Dell for its middling trackpad. Regular pointing, clicking and multi-touch is hit-and-miss; I had to spread my fingers apart to get two-finger scrolling to work properly, for instance. You might say "then use a mouse, moron," but the MacBook Pro's trackpad is excellent, for one, and doesn't force you to lug around an unneeded accessory. Something the MBP won't have any time soon, however, is a touchscreen. Using it on the M3800 with a program like Adobe Photoshop or Premiere Pro (after tweaking the scaling) is very intuitive, particularly when zooming photos or scrolling video. All the touch functions work flawlessly most of the time, but there's another "gotcha." This one has to do with Windows 8 again, as touch functions in certain apps lag or don't work at all, particularly on dialog boxes. Using it with Chrome, for instance, was nearly pointless thanks to the delay. Performance, on the other hand, is impeccable. Rendering a one-minute file in Premiere Pro CC to H.264 at full HD (from a Quicktime ProRes source) took fewer than 30 seconds at medium quality, handily besting most other laptops I've used. All told, the one area where performance trails is battery life. In our video rundown test, the M3800 Precision lasted 3.5 hours at best, less than half of what the MBP and many PCs are capable of. I'd partly chalk that up to the power-hungry QHD+ screen, not to mention the smallish 61Wh battery. There's a larger 91Wh option that would effectively boost that figure by 50 percent, but even then, the battery life would still lag behind the MacBook Pro's. In sum, no other Windows laptop can match the M3800's combination of power and weight, except for maybe its cousin, the XPS 15. Other candidates include Lenovo's Thinkpad W540, the Gigabyte U35F and maybe a gaming rig like the MSI GE40. 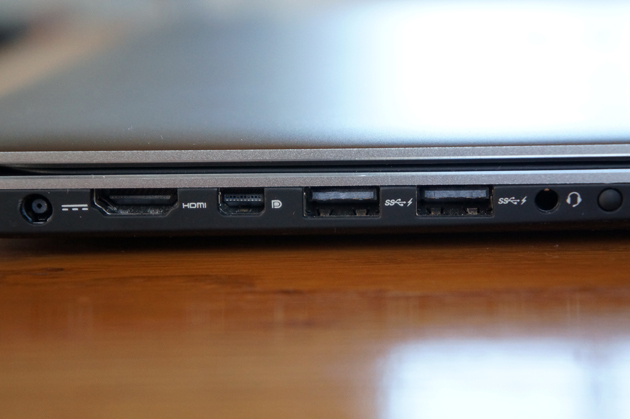 (Note that MSI's GS60 Ghost, which came out after this review was finished, also looks promising. And as some commenters have pointed out, the new Razer Blade 14 is now a contender with a 3,200 x 1,800 screen.) However, most suffer from either inferior graphics, lesser screen quality or too much bulk. That leaves the Retina Display MBP as its only real competition in the lightweight/powerful/high-res arena. And unfortunately, the M3800 falls down in key areas -- namely battery life, trackpad reliability and high-res app support. Then again, the MBP makes do with slightly lower resolution and no touchscreen. Also, the 15-inch MBP's discrete graphics package includes NVIDIA GeForce 750M/Intel IRIS GPUs, compared to the workstation-caliber Quadro Pro graphics on the M3800 Precision -- though benchmarks suggest the 750M actually works better. If you need a powerful, light Windows laptop with discrete graphics, I'd heartily recommend the Precision M3800 over other PCs. However, with the MacBook Pro in the mix, I'd personally choose that instead. Despite some excellent qualities, it's the details that count the most. Update: As some commenters have pointed out, the new Razer Blade 14 now has an optional 3,200 x 1,800 screen, better (though non-professional) graphics and a similar price to the Dell. Update 2: It appears that recent updates to Windows 8.1 (that occurred after this IRL was written) have resolved the scaling problems with most Adobe apps. However, Google's Chrome still seems to suffer from those issues, while Firefox and Internet Explorer work just fine.